Have you ever heard of Baltic Amber? Amber is fossilized tree resin. As the resin warms with body heat, it releases an oil which contains succinic acid. Baltic Amber is mined near the baltic sea, and receives its name from the location it is mined from. After the succinic acid is absorbed into the skin, it works like a natural ibuprofen by blocking pain and reducing inflammation. In order for the amber to work well, it should be close to the source of pain. Succinic acid is an alkalinizing acid (like lemon juice) so it won’t add to your body’s acidity, and may actually slightly lower it. Baltic Amber has some of the highest concentrations of succinic acid found in nature. Succinic acid is a naturally occurring dicarboxylic acid used in many products every day, it is not dangerous. Baltic Amber has been used for centuries for teething pain. In Europe, Baltic Amber jewelry has been used as a natural remedy for pain relief for hundreds of years. Baltic Amber jewelry comes in many shapes and sizes. We personally use a necklace and an anklet for Bunny. I also use an anklet when my knee starts hurting from a prior knee injury, and Bunny’s Grandma uses a Baltic Amber necklace to help with her arthritis. Baltic Amber also helps with drooling by stimulating the thyroid glands, and irritability that is often accompanied with teething. There are many great uses for Baltic Amber! 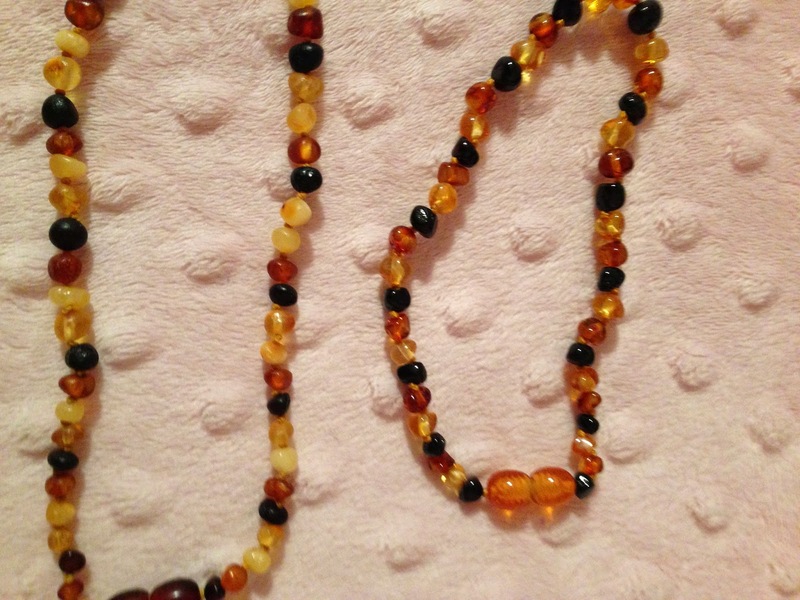 When you or your baby wears Baltic Amber the “beads” warm up with your body heat and release the succinic acid. The succinic acid absorbs into the body and relieves pain and inflammation. 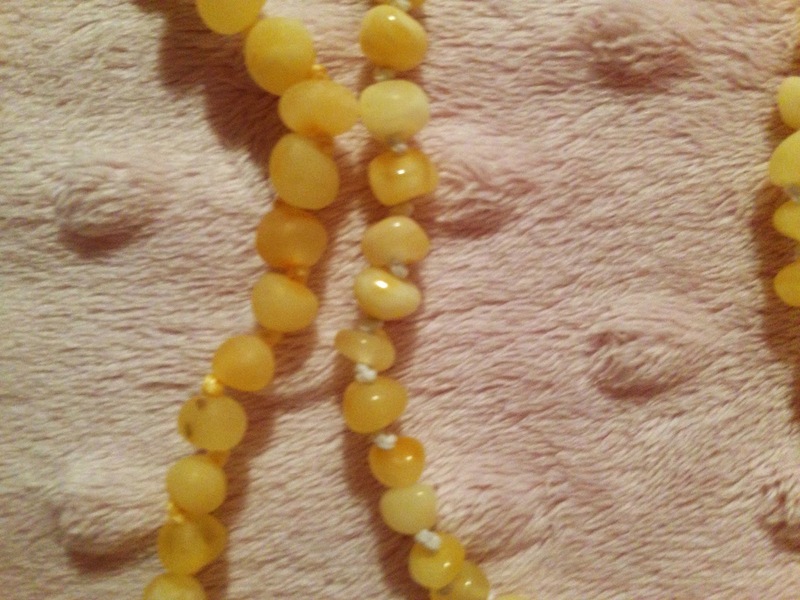 Baltic Amber necklaces are meant to be worn NOT to be chewed on. Bunny has a necklace that is long enough to be comfortable, but short enough that she can’t easily chew on it. Bunny has been wearing Baltic Amber since she was about 4 months old and never had any issues pulling, tugging or chewing on the necklace. Now Bunny is 15 months old and does occasionally put the necklace in her mouth while she is wearing it. For this reason, your child should be supervised when wearing a Baltic Amber necklace. The beads are typically strung together and tied in between each bead, making it difficult, but not impossible, to break. You should NEVER let your baby go to sleep while wearing any necklace. When Bunny sleeps, she wears a Baltic Amber anklet and always has a sock over it or a footed pajama on. 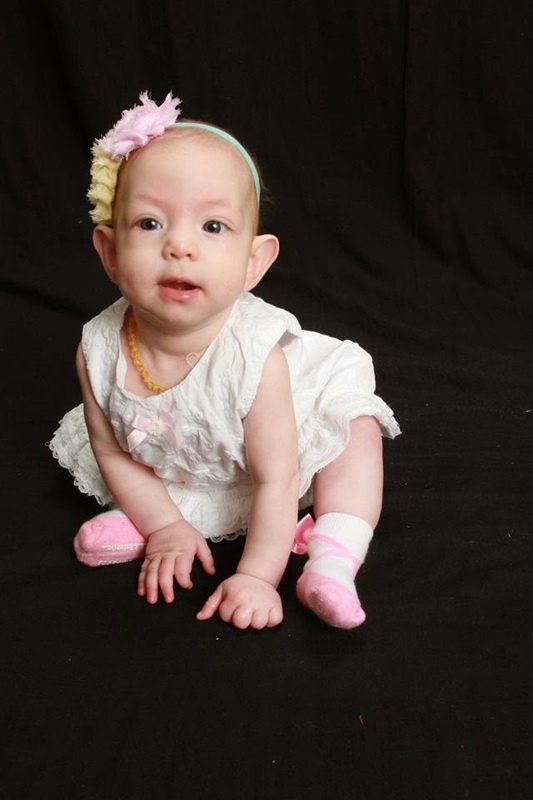 Bunny at 4 months old wearing her Baltic Amber necklace. 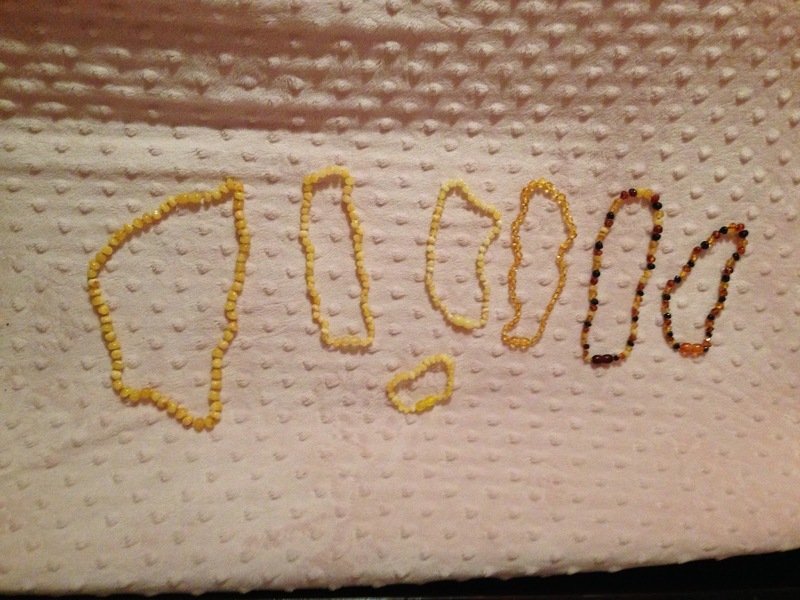 Does Baltic Amber really help with pain while teething??? In my experience, YES!!!!! Bunny is not a horrible teether, but I can definitely tell when she is teething. Before I started using Baltic Amber, when Bunny was teething she was grumpy, didn’t sleep well, drooled like crazy and had a runny nose. As soon as we started using Baltic Amber for teething, Bunny was MUCH happier and her drooling and runny nose were non existent. When Bunny wears her Baltic Amber, she sleeps soundly. There were a couple nights we forgot to put the Baltic Amber back on after bath time and the difference was extremely noticeable. When Bunny’s teething was really bad, I made sure she wore her Baltic Amber 24/7. There was a major difference when Bunny wasn’t wearing her Baltic Amber compared to when she was. My Love thinks they are a placebo, but he also makes sure Bunny is wearing her Baltic Amber every day. He can tell they make a difference, he just doesn’t want to admit it. Bunny’s Grandma used to take anti inflammatory medication daily for her arthritis. Once she started wearing a Baltic Amber necklace, she noticed such a difference that she stopped taking her anti inflammatory medication! Bunny’s Grandma no longer takes anti inflammatory medication, she simply wears her Baltic Amber necklace daily. 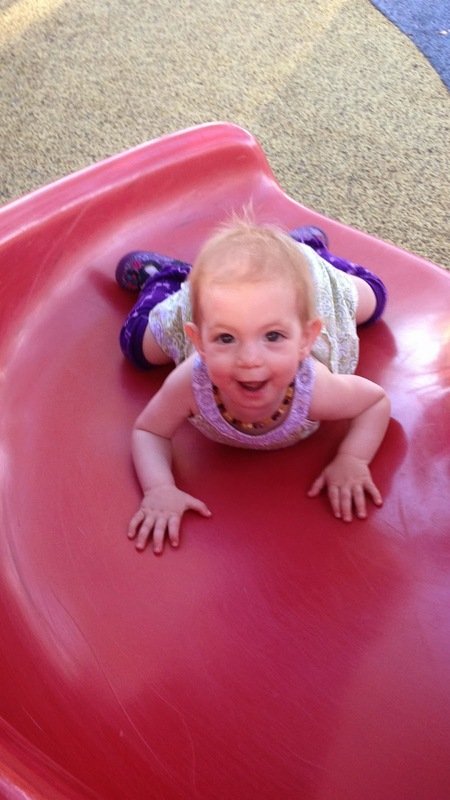 Bunny at 14 months wearing her Baltic Amber necklace. I occasionally wear Baltic Amber when my knee or other joints hurt. I can tell the Baltic Amber does make a difference. The most effective Baltic Amber is one that contains more succinic acid. Generally speaking, the lighter the color, the higher the concentration of succinic acid. The lightest colors can contain up to three times more succinic acid than the darker colors. Raw Baltic Amber is untreated and unprocessed amber that comes directly from the Baltic Sea. Raw Amber is in its true form and is know to contain extra layers of succinic acid, which is what helps relieve pain and inflammation. Some people strongly believe that raw vs. polished is more important than the color. Because raw Amber does have extra succinic acid, it is considered to be the maximum strength Amber. Unpolished Amber is when the amber is shaped so the sharp edges are smoothed but the matte surface is left. These beads have a smaller surface than completely raw amber beads, but these beads touch more of the skin than raw beads due to their shape. Because of this, unpolished amber typically has the same affects as raw amber. Polished Amber is when the amber is shaped so the edges are smooth and the surface is polished to a shiny state. Polishing is done in an abrasive way, such as sand paper, or by heating. This type of amber has less surface, has a harder time releasing healing oils and amber acid. Polished amber does look more like the jewelry you typically see, which it more attractive to some. Polished amber does have healing properties, but it is less than unpolished amber. Left to Right: Adult necklace and five baby necklaces from light to dark. Bottom is a baby anklet. Left is unpolished, right is polished. There are many ways to fake a Baltic Amber necklace, and wearing a fake one won’t help you at all. The easiest way to “test” your Baltic Amber to know it is authentic is to put it in salt water and see if it floats. Real Baltic Amber will float. There are many places to buy Baltic Amber, I have purchased mine from a few different stores. Many health food stores, vitamin stores, and natural baby stores often carry Baltic Amber.